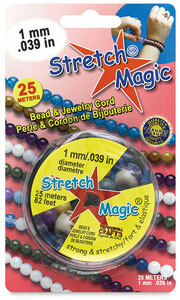 Stretch Magic is the world's best-selling elastomer jewelry cord. Strong, durable and non-fraying, Stretch Magic offers great elasticity and resiliency, making jewelry easy to wear and remove. It also offers excellent crimping strength due to its "toughness." ® Stretch Magic is a registered trademark.